There's lots of things to learn about poodles. Since they are non shedding dogs, they will need to be groomed every six weeks or so and should be brushed daily. It's best to take them to a professional groomer if you can find one you like in your area. The groomer can bathe them before their haircut, or you can bathe them yourself at home. Make sure you have a set schedule for doggy bath time throughout the year. Lovable poodles have been around for over 500 years! Contrary to popular belief, they aren't snobbish animals at all! They are extremely intelligent animals and like to learn new tricks and games. Keep them engaged, talk to them, and try to keep them from getting bored. They were once hard working dogs and also stars of circus shows. Find out more about the poodle history. 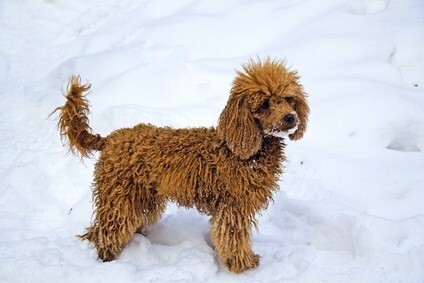 Poodle dog colors vary from black to silver to apricot. There are also two breeds - the phantom and the parti, that are bi-colored. They have two different colors on their coats. The brown toy poodle puppies are absolutely adorable! If you're curious about what sights your dog can see, what her sense of smell is like or what his taste buds are like, you'll find more information on the poodle dog senses page. Want to learn some fun poodle facts? We have a page of interesting facts about your beloved dog. Find out the three sizes, and why the parti poodle isn't such a party animal after all! Poodles are very loving and adorable animals. Although sometimes they seem more human than pet like! Getting to know your dog helps you appreciate, love and understand him even better than before! May you grow old gracefully with your lovable pooch. He will make you laugh and fill your home and heart with lots of love.